On a distant alien planet, a quartet of human women have been tasked with researching the environment and civilizing the natives. But as is typical of these types of endeavors in science fiction, things go horribly wrong. Sophie Goldstein’s House Of Women is a striking, suspenseful new graphic novel from Fantagraphics, showcasing the cartoonist’s talent for pulling readers deep into foreign environments and crafting narratives that use those settings to enrich character relationships. 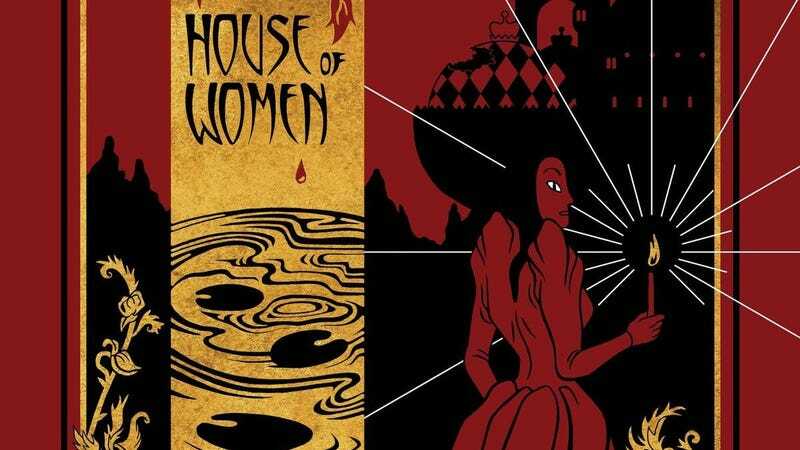 With its gilded cover and colored page edges, House Of Women has a design that makes it look like an artifact despite being a new work. It’s a gorgeous hardcover, and the elegance of its trade dress makes it stand out while informing the interior contents, which are similarly refined. This exclusive preview of House Of Women begins with a splash page highlighting the atmosphere Goldstein creates with her graceful linework, and while the three women are relaxed as they soak in the pond, there’s an ominous quality to this scene thanks to the intense contrast of light and dark and the competing textures. Each of the central four women has distinct facial features and body types that set them apart, and the shot of Rhivka lurking in the pond on the final page shows how Goldstein uses physicality to indicate emotion. The sharp angles of her body combined with the messy cascade of curly hair reveals a woman who is becoming increasingly unhinged, and her obsession with the man she’s spying on will eventually pose a major threat as the story continues. Readers can discover the disintegration of this quartet by picking up House Of Women tomorrow, and the craft on display in this excerpt is just a small taste of what Goldstein accomplishes in this book.